One thing I love about where we live is that there is always something to do. On Saturday night, after a busy day of tball and helping out on little man’s school carnival, we got little man dressed in his Jango Fett costume and headed to the Alligator Farm for their Creatures of the Night event. Little man loves Alligator Farm. The park is manageable with some really great exhibits and awesome, knowledgeable staff. We love seeing the live alligator feedings, and the up close and personal encounters with some of the animals on exhibit. For some reason, we have never been to the Trick or Treating event before, but it was about time to give it a try. We arrived at about 5:15 PM and had to wait on a bit of a line prior to opening. The entrance area is on the smaller side, so we expected there would be a backlog to purchase tickets. It wasn’t an issue, however. There were plenty of special guests on hand to entertain the kiddos. Shortly after 5:30, we had paid our admission and entered the park. 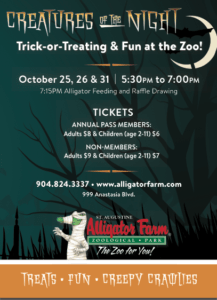 After the first few alligator enclosures, there was a table set up, where two staff members were handing out plastic trick or treat bags and animal print slap bracelets. After that directional signs pointed the way around the park to the different treat stations. Since it was still fairly light, we were able to see most of the alligators and crocodiles through the park. The path took us through all the major areas of the Alligator Farm. The tour took about 90 minutes, and we could have stayed longer for the 7:15 nighttime gator feeding, but the Mr PugRunner and little man were getting hungry and the temperatures were dropping, so we opted to head to dinner instead. What I thought was really great was that instead of treat stations doling out handfuls of candy, most of them were interactive learning stations. Handlers were present with animals (most of whom could be touched), doing little mini-lessons and answering questions. And then kids were given an animal-themed trading card with a photo and fun facts, and something like a toy snake or alligator clapper (the only food items given were animal crackers and Chex mix). I absolutely loved this owl. And little man thought the skink was pretty cool. We could have spent all night petting this sweet white rabbit. And check out Katniss holding it! The handlers were pretty much all in costume, which was so great. Of course, there were creepy, crawly things, too. And of course, it wouldn’t be Alligator Farm if we didn’t get to pet this little guy. We also got to meet a turtle, some mealworms, a Florida king snake and a huge boa constrictor. I think the coolest “treat” was at the back of the “swamp” area, where all the alligators swim beneath a wooden walkway. You can feed the gators a kind of kibble that you buy from a vending machine for 25 cents, but on this night, staff members gave all the kids some huge alligator biscuits to drop into the water. The gators went crazy! The very last station was a mask-making center, where kids got to choose a foam mask and decorate it with stickers. Before leaving, we grabbed some water and a quick snack and little man pored over his loot. We were extremely impressed with the thought and care that went into the evening. It was busy, but not so crowded to make the experience unenjoyable. The price was great and the encounters were memorable. We will definitely be trick or treating there again in years to come. Do you have local establishments that offer trick or treat night leading up to Halloween? What’s your favorite Halloween candy to give or receive? Definitely let me know if you ever make it up here and want company! It’s a really cool day out! I Love, love, love the Alligator Farm! My brother actually worked the zip line this summer haha! Wow, really?? That’s so cool! I’m terrified of that thing. When those people go flying over the gator pit, my heart is in my throat for them! He used to have to go out and “rescue” people who would freeze mid zip line all the time haha! I’m glad he was safe in his bowl, and not out for petting. Our zoo does a Zoo Boo event each year but we haven’t been impressed with it the past few years so we decided not to go this year 🙁 The girls loved the pumpkin patch though! Our zoo does a Spooktacular, and it’s cute, but this was much better.